Bangladesh and Russia have signed a protocol to amend their 2011 agreement to build the South Asian country’s first nuclear power plant. 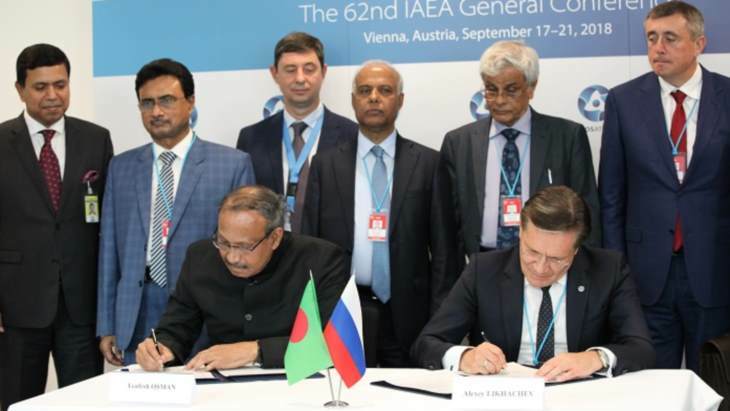 The document was signed yesterday by Yeafesh Osman, the science and technology minister of Bangladesh, and Alexey Likhachov, director general of Russian state nuclear corporation Rosatom, during the International Atomic Energy Agency (IAEA) General Conference in Vienna. Two VVER-1200 units are being built at Rooppur, which is on the eastern bank of the river Ganges, 160 km from Dhaka. Rosatom in February 2011 signed an agreement for two 1000 MWe-class reactors to be built at Rooppur for the Bangladesh Atomic Energy Commission. The initial contract for the project, worth USD12.65 billion, was signed in December 2015. The Bangladesh Atomic Energy Regulatory Authority issued the first site licence for the Rooppur plant in June 2016, allowing preliminary site works, including geological surveys, to begin. Between 2016 and 2017, preparatory works were performed at the Rooppur construction site, and detailed design documentation and materials required to obtain a site licence and a construction licence were developed. On 4 November 2017, the regulatory authority of Bangladesh (BAERA) issued a licence for the plant design and its construction. On 20 November, a ceremony was held to mark first concrete pouring for unit 1. On 14 July this year, first concrete was poured for unit 2. The general contractor for the project is AtomStroyExport, Rosatom’s engineering subsidiary.